Motorcycle Live opens its door at The NEC next month for nine days of all things two-wheeled. The event offers something to entertain everyone, no matter what their age or ability on a motorcycle. 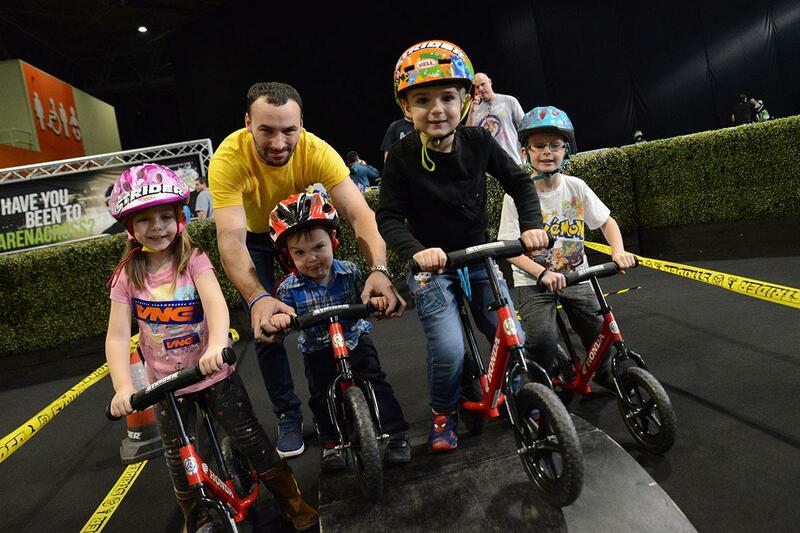 The Strider Adventure Zone is back, providing a safe and friendly riding area with ramps, see-saws and rumple strips that encourages kids aged 18 months to five years to explore balance and mobility on a bike. Demo bikes and helmets are provided in this FREE feature that will give your little one a taste for life on two wheels and start them on their journey to becoming a motorcyclist. This free experience is a full-powered Arenacross, with two mini-Arenacross (AX) dirt tracks suitable for first-time and intermediate ability girls and boys from the ages of four to 12 years. Youngsters will get the chance to ride an ultra-cool electric AX machine, kitted head-to-toe in the latest AX-branded kit with instructions from the best AX coaches. Youngsters aged 14 and over can take advantage of a free 20-minute riding lesson with a professional instructor at the Get On feature sponsored by Lexham Insurance. Participants will be introduced to the brakes, gears and slow speed handling, giving them that all-important first experience of motorcycling in a safe and friendly environment. Moto-Cirque is a brand-new live action arena that promises to bring the very latest technology together with world class stunt riders, lasers and music. With seats so close to the action, your kids will feel like your part of the show! Moto-Cirque will take place three times a day at weekends and twice a day during the week. Best of all, this is also free. 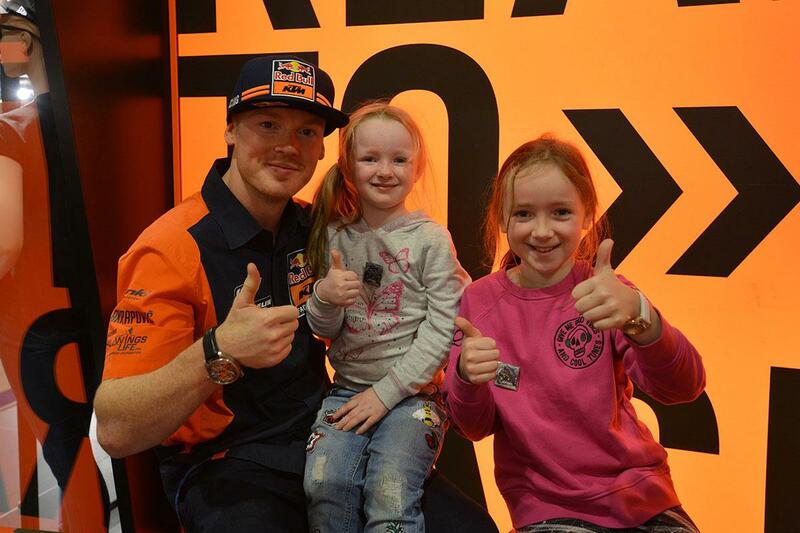 Motorcycle Live is one of the best places in the UK to meet racers while they’re relaxed and away from the stresses of the paddock. Arm yourself with the daily schedule of autograph signings and rider appearances and make it you and your kids’ mission to seek out as many of their racing heroes as you can! Take it one step further than just meeting racing legends and try and beat them at their own game! ‘Race the Ace’ takes place at 11.30am every day on the Blackhorse Stage and sees a well-known racer go head-to-head with a member of the audience on the Isle of Man TT computer game (children aged 14+ can take part). It’s not just the grown-ups who can climb aboard the hundreds of bikes on display and try them for size – manufacturers are more than happy to see the kids giving them a go too. There’s nothing quite like sitting astride a big, shiny motorbike to bring a big, cheesy grin to a child’s face. Motorcycle Live is a fantastic one-stop-shop for all the latest motorcycle kit and accessories, with loads of retailers offering jackets, trousers, boots, helmets and casual wear for kids. Get them trying on all the gear they’ll need to be riding pillion with you or even getting on their own two wheels in the not-too-distant future. Aside form the brand-new bikes on display, there are also some weird and wacky machines that will amaze the youngsters. Head to the Custom Xtreme Zone supported by Back Street Heroes to feast your eyes on some unique, hand-built beauties. Motorcycle Live 2018 takes place at The NEC, Birmingham from November 17-25. Advance tickets are on sale now priced at just £19.50 per adult, £12 for Seniors, £1 for 11-16 year olds (children under 16 must be accompanied by an aduly) and free for children aged ten and under. There is also a £25 advance ticket, which includes entry to the show and an Oxford HD MAX disc lock worth £25.00. To book, call 0844 581 2345 or visit www.motorcyclelive.co.uk.